What is a Marianist Parish? The Marianist Spirit Committee insures that the charism of the Society of Mary is seen in deed as well as word. The parish sponsored activities are geared to be, where possible, inclusive of all ages and any group seeking involvement. Jesus came to serve. In imitation, our parish actively seeks opportunities to reach out to the people of our city to promote peace, justice, & the integrity of creation. These are central to the ministries of the parish and so have preference when ministries are considered. Click Here to review our parish ministry opportunities! Parish Retreat – to learn more about our faith and ourselves. Parish Pilgrimage to Bergamo Center in Dayton – a time for quiet personal or group reflection. Guest Homilist from the Marianist Community – to learn about the Marianists. Lenten Soup Suppers – to share a simple meal together and learn about one another. All Ages Event, such as the Scavenger Hunt – to learn about our SFDS history and our community. Investigating opportunities for nationwide and/or worldwide Mission trips. Monthly Service to Others Program – to support the six Service Agencies associated with our Parish to help those among us. The Society of Mary was founded in France in 1817 by Blessed William Joseph Chaminade. Approximately 500 brothers and priests comprise the Province of the United States. The following Marianists reside at St. Francis DeSales and serve in various ministries in the Cincinnati area. Bro Giancarlo is the former Director of Mary Magdalen House in Over The Rhine, located at 1629 Republic Street. Mary Magadalen House is an oasis for persons in need, to shower, shave, brush their teeth, have their clothes laundered, have use of a phone and have a place to receive messages and mail. The staff believes that dignity is the beginning of hope. They are opened Monday through Friday 8:30 am to 4:00 pm and Saturday 8:30 am to 12:00 pm. Their aim is to maintain and restore human dignity to those who know the hardships of living on the streets. Bro. Bob was born and raised in Pittsburgh, PA. He studied Music Education at Edinburo State College. He entered the Marianist in 1994, and for the last twenty years served at St. Aloysius School/Parish in Cleveland. He will be teaching music at St. Francis de Sales Elementary School and St. Cecelia School in Oakley. Bro. Bill has been a Marianist brother for 56 years. He taught, counseled, and coached in Marianist schools for forty years. When he retired from high school teaching, he moved to Cincinnati. He lives in the Parish Family Residence and has worked with Mercy Neighborhood Ministries as an Educational Specialist for the last eleven years. He likes to walk and enjoys reading. Bro. Bob was born in Cleveland, Ohio. He graduated from Holy Name High School, in 1959, where upon he entered the Society of Mary (Marianists). He made first vows in August, 1960. He graduated from the University of Dayton with a Bachelor’s degree in Education. His first teaching assignment came in 1964 at Purcell High School (later Purcell Marian), where he has been until 2015. Bro. Bob studied at the University of Cincinnati, receiving a Master’s degree in Special Education in 1972. He started the first slow-learner program in the Archdiocese of Cincinnati and OWE (Occupational Work Experience) at Purcell Marian. During his years at Purcell and Purcell Marian, he has held various positions: moderator of the marching band and band boosters, business manager, teacher, and lockers and bingo manager. Bro. Bob joined the De Sales Marianist Community in 1998. He is sacristan and organizer of the Mass Ministries at St. Francis de Sales Church, as well a member of Pastoral Council and the Marianist Spirit Committee. While at Purcell Marian, Bro. Bob has received several awards that include: Service Award, Master Teacher Award, Christian Leadership Award and the Award of Excellence from the Alumni Association. After being in private practice for several years, Bob Donovan entered the Society of Mary. Following profession of vows, he returned to Cincinnati and became Medical Director of the Cincinnati Health Care for the Homeless Program in 1988. 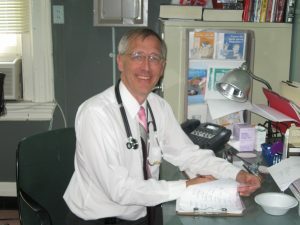 As part of his duties he has delivered primary care to people experiencing homelessness on the Mobile Medical Clinic at several of the shelters in the Cincinnati area for 24 years, and he currently cares for people experiencing homelessness (and others) at the McMicken Health Collaborative in the Over-the-Rhine neighborhood. He also is Medical Director of the Center for Respite Care, a 24/7 recuperative facility for homeless people recovering from medical and surgical illnesses. Bob has been President of the Board of the National Health Care for the Homeless Council, served on the Steering Committee of the Health Care for the Homeless Clinicians’ Network and has been chair of its Communications Committee. Bro. Ed graduated from Purcell in 1962 and entered the Marianist Novitiate. Following his basic Marianist formation program he graduated from the University of Dayton and began teaching high school. At a later time he completed a masters in school guidance and a few other post graduate programs. Most of his life has been teaching in High Schools, and 33 of those years were in Marianist schools in Cleveland and Dayton Ohio, and in Dublin, Ireland. Additionally he served in San Antonio, Texas and in Mexico for 12 years in various capacities of administration and in Marianist formation programs. Since moving to the Marianist Community at DeSales, he has been a volunteer tutor at Purcell High School.